An avascular stroma of collagen fibers that is sandwiched between the corneal epithelium and endothelium, stretches from limbus to limbus of the cornea. A consistent lattice-like arrangement of the stroma’s hydrated collagen fibers and the overall volume they occupy (fibril volume fraction) in the cornea is critical for the maintainance of corneal transparency. A proper fibril volume fraction reduces light scattering allowing for corneal clarity. Small numbers of keratocytes are also found within the corneal stroma. In addition to regenerating and repairing the cornea, these keratocytes synthesize water soluble crystallins. Crystallin proteins decrease backward light scattering by keratocytes increasing corneal transparency. The corneal epithelium also contributes to corneal transparency by providing a glycocalyx lattice that retains the tear film. The smooth optical surface of the tear film prevents light refraction at the air-tear film interface. This reduces the large degree of light scattering that typically occurs through changes of media (e.g. air and watery tissue). Light dispersion is thus minimized by the epithelium and subsequently by the rest of the eye. The corneal epithelium also functions as a semi-permeable barrier to prevent the influx of tears into the corneal stroma so that it remains relatively dehydrated. The transparency of the corneal epithelium itself is attributed to its consistent refractive index, a lack of vascularization and pigmentation, and a relatively dehydrated state. The corneal endothelium consists of a single layer of cells that lie along the inner surface of the cornea. This layer governs the transport of fluid between the anterior chamber and the corneal stroma. It also allows nutrients within the aqueous humor to enter the stroma. Significantly, the majority of corneal endothelial cellular energy is used in the active transport of water from its stromal to aqueous surface. The effect of this pumping is to dehydrate the cornea to levels associated with maximal optical transparency. A healthy cornea is optically transparent (Figure 1). Corneal opacities are associated with disease. The limited diversity of corneal cells limit their responses to disease processes. There are generally seven different abnormalities associated with corneal opacification: cellular infiltration, fibrosis, pigment deposition, mineral accumulation, edema, corneal sequestration, or the presence of a foreign body. 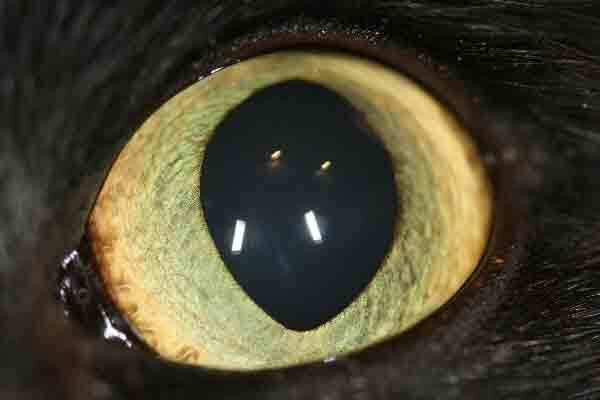 Each corneal opacification has identifiable features that can be associated with underlying pathology. This knowledge will therefore influence diagnoses and subsequent therapies. In my next article I will discuss the signs, proper diagnoses, and treatments associated with an ocular opacification. If you have any further questions regarding corneal transparency, please feel free to consult with a veterinary ophthalmologist.